I‘ve learned previously not to initially judge a band by their choice of names. The band POUNDER out of California gave me that education a few months back. Initially, I absolutely hated their name. Then I heard their music and fell in love with that EP. Now, the name barely fazes me. So when I saw MONSTER TRUCK in my queue of albums to review, I couldn’t help but think, here we go again. I don’t dig the band’s name. 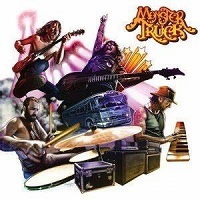 MONSTER TRUCK is a four piece band hailing from Hamilton, Ontario that came off the assembly line in 2009. Citing influences ranging from beards and hockey, to flying elbow drops and spiders, they certainly sounded somewhat cliché, if not a tad bit juvenile. And, still there was the name. So, without any further avoidance, I hit play. The album begins with the title track, “True Rockers” and some banter/call outs between band members. Not a good start. It just reinforces the cliché/juvenile assessment again for me. The song itself is interesting. A mix between GRANDFUNK RAILROAD and CLUTCH. In fact, the song goes full on CLUTCH with a nearly spoken portion that was far too close to the feel of “How To Shake Hands” on CLUTCH’s new album. So far I’m not connecting with this much at all. The next track “Thundertruck” is an improvement, but I’m still concerned this one is going to be tough to spin positively. “Evolution” launches, and suddenly I feel like I’ve made contact. The CLUTCH vibe is still incredibly strong, and in fact remains prevalent throughout the album. But, beginning with “Evolution” and continuing with “Devil Don’t Care” and “Being Cool is Over” the band begins to create their own identity more and more. They’ve got strong hooks, catchy choruses combined with a steady band performance. There’s not much flash or showmanship happening here. Just sturdy, talented playing throughout, with a hint here and there of what’s really up their sleeves. “Wild City Hearts” really resonated with me with its 80’s metal ballad feel and memorable vocals, it’s easily my favorite track. “Undone” is a good follow-up, though the band takes us in a completely different direction. This one has an absolute SOUNDGARDEN groove, and in fact, the vocals are eerily reminiscent of Cornell. Seriously, it’s spooky like. “In My Own World” falls completely flat for me, and the next track “Denim Danger” sounds far to0 similar to the previous track. It’s almost as if it’s the same music for both songs, with different lyrics and tempo. The album returns to the CLUTCH feel with “Hurricane” before “Howlin” brings Chris Cornell back to life again. “True Rockers” is a very intriguing album, and one I’m having a hard time processing. I really liked about half of it, and the songs I did like, I really, really liked. The other half, just didn’t connect with me. After two listens, I really just don’t feel inspired enough to archive this one in my collection.